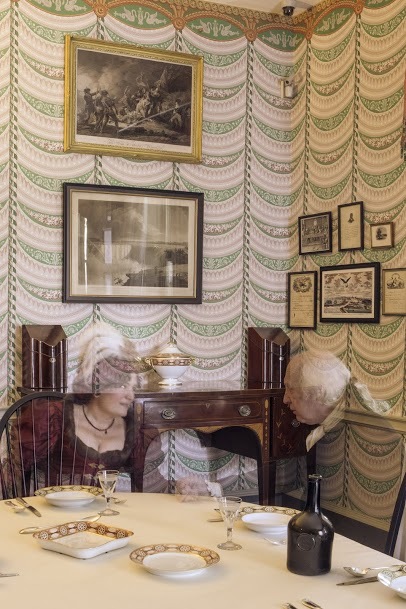 On this day, a photographer from National Geographic took some intimate shots of "James and Dolley Madison" at home in Montpelier. 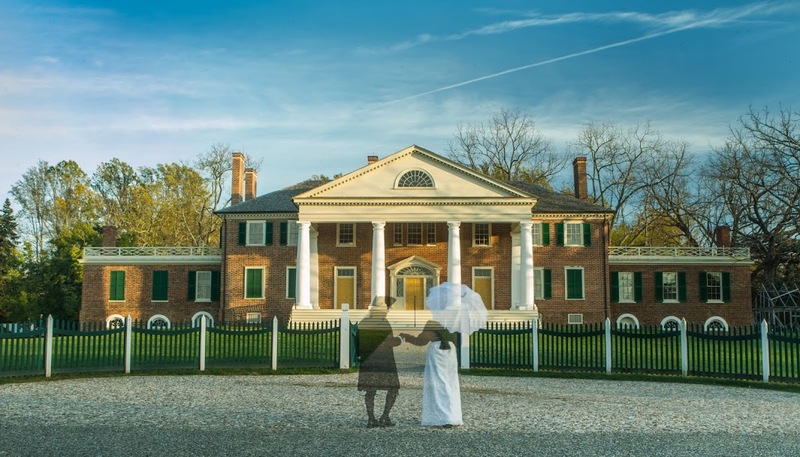 He used an innovative photographic technique that "ghosts" the images of the people, making them look spectral and insubtantial, while maintaining a solid background of all the lovely objects at Montpelier. 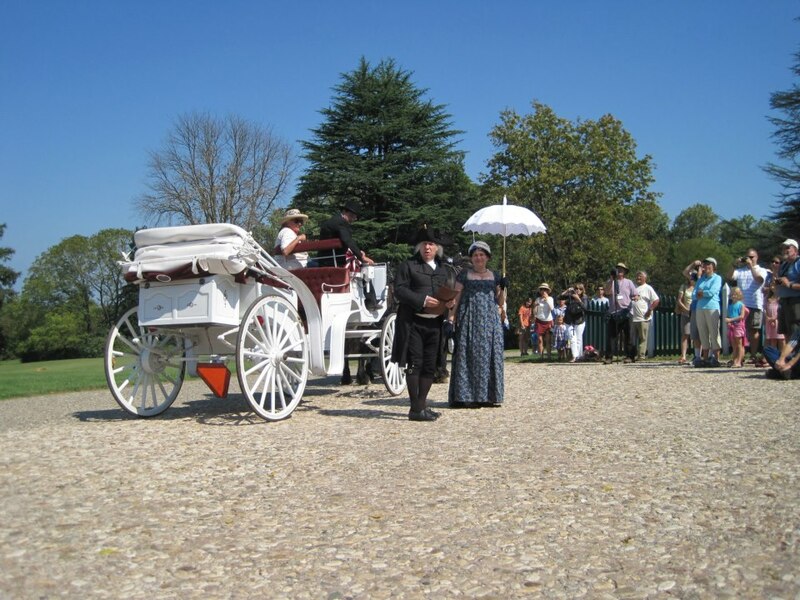 (A couple of the carriage photes were taken without the ghosting technique, and they are included for their loveliness). 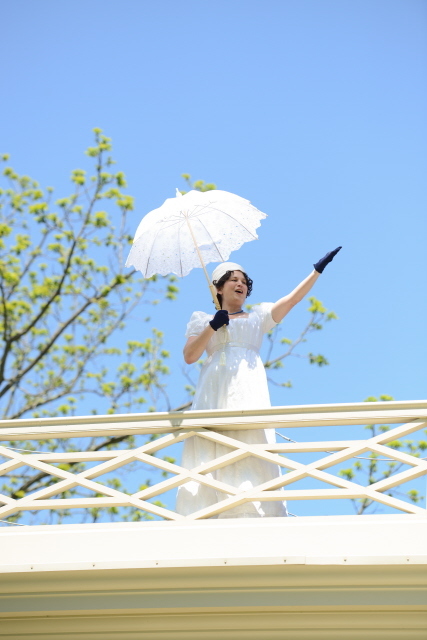 All of tese images are by Kenton Rowe Photography, courtesy of the Montpelier Foundation. 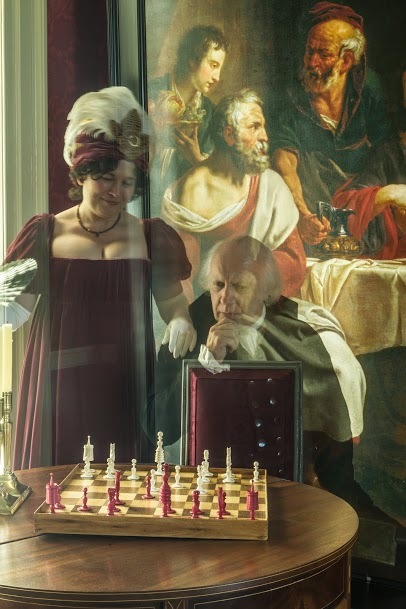 After the British invaded Washington City and burned the White House on August 24, 1814, James and Dolley Madison were forced to flee the city. President Madison, certain that the British were pursuing him with the aim of making him a prized prisoner of war, spent the next three days in constant motion, moving from place to place. But he spent the night of August 26 in Brookeville, Maryland, with his cabinet, and together they strategized about the next steps they would take in the war. The town has since immortalized that night by dubbing itself "The United States Capital for a Day." 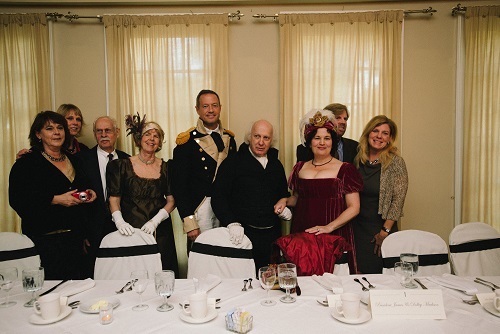 The town is planning a spectacular commemoration for next year's bicentennial of that event, and on October 27, 2013, James and Dolley were pleased to participate in a fundraising event to help fund that celebration. 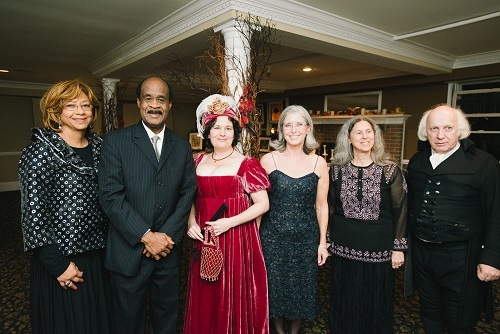 An elegant dinner was served at the Inn at Brookeville Farms, followed by a silent auction. 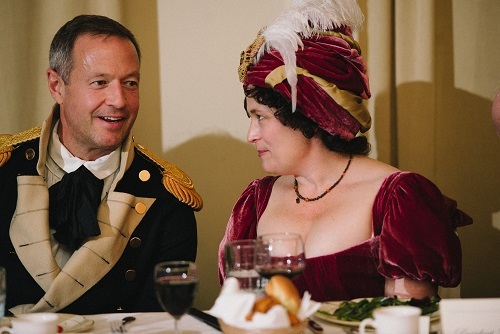 this event to fruition, and Governor Martin O'Malley. 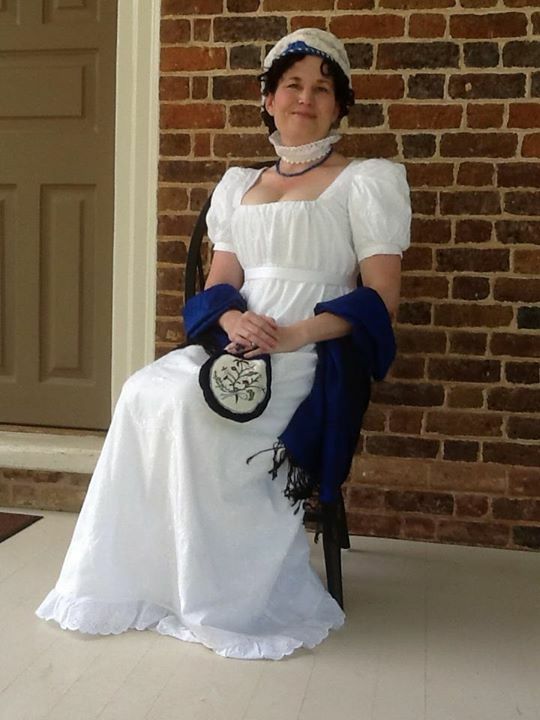 interregated Mrs. Madison about her lavish spending habits. If this evening was any indication of this community's spirit, then the British won't stand a chance against us! Although the house where James Madison was born was later destroyed, another plantation house -- almost as old -- was built on the same site: Belle Grove. 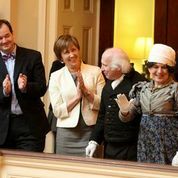 In the summer of 2013, James Madison's birthplace opened to the public as an elegant Bed & Breakfast, and Dolley and James were pleased to share in some of the opening festivities. 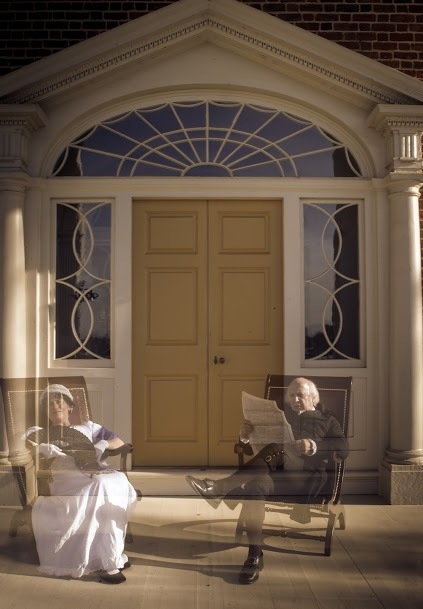 Later, Mr. and Mrs. Madison were pleased to be the pampered guests at Belle Grove Plantation, and this tranquil interlude was captured in a "Portraiture Shoot." Mark and Mary Chamberlin, the husband-and-wife photography team, are true artists, as anyone can see from the fruits of the day . . .
To learn more about how Brett and Michelle Darnell are getting on during their project to restore this historic home and transform it into an elegant B&B, visit their website or Michelle's blog. The sitting room at Belle Grove. 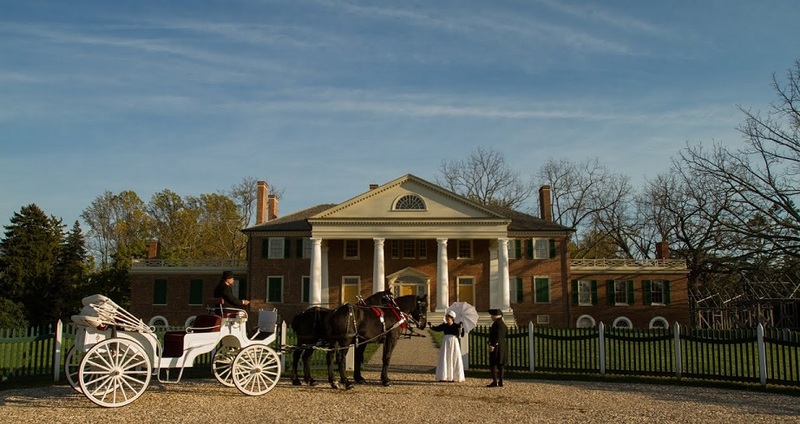 Photo by Chamberlin Photography of Stafford, VA. To see more photos of the Madisons at Belle Grove, see the Chamberlin's Facebook page. 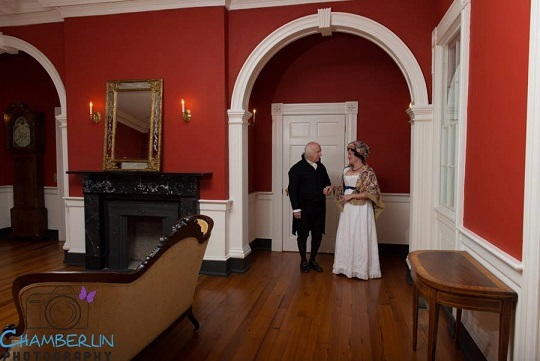 Photos by Chamberlin Photography of Stafford, VA. To see more photos of the Madisons at Belle Grove . . . See the Chamberlin's Facebook page. 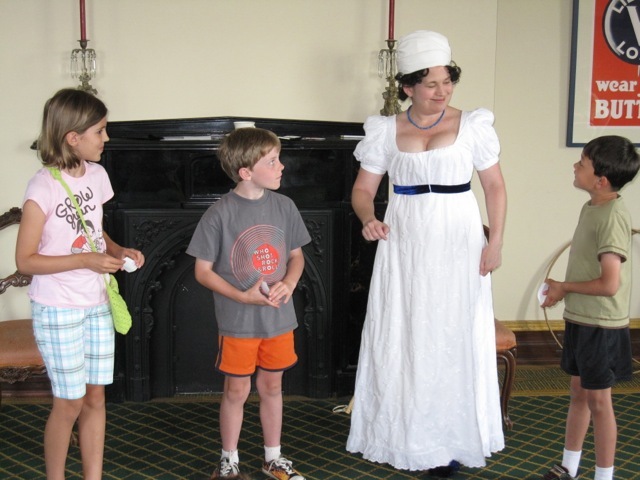 The Woodrow Wilson Library, in Staunton, Virginia, hosted it's seventeenth annual "Journey into History Summer Camp." The theme of the 2013 camp was: "Pathways to the Presidency: Virginia's Eight Presidents." 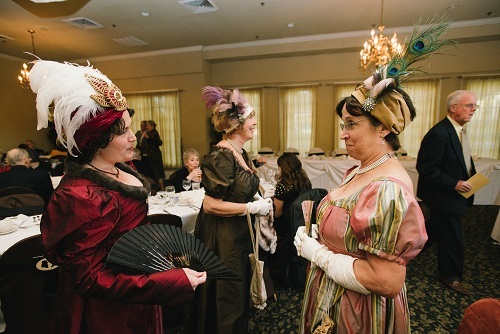 Each of the two week-long sessions included games, crafts, and activities, and the camp culminated in an inaugural ball. 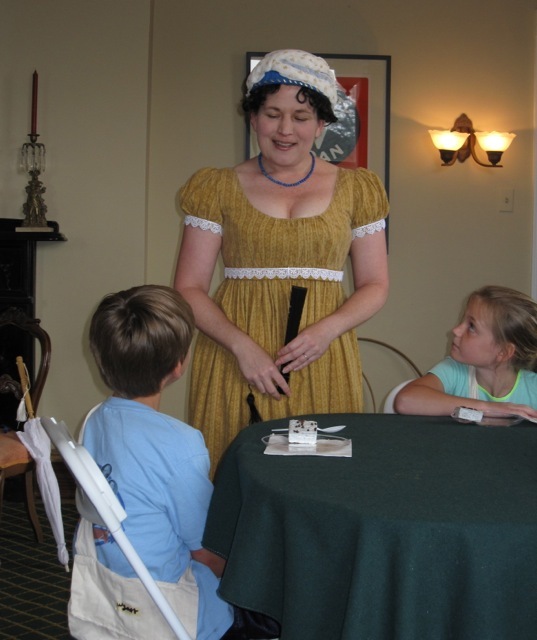 During each session, Dolley Madison visited with the campers and discussed etiquette and the social graces from the perspective of her own life and times. saying their final adieus, she receives a bow from one of Virginia's newest gallants. 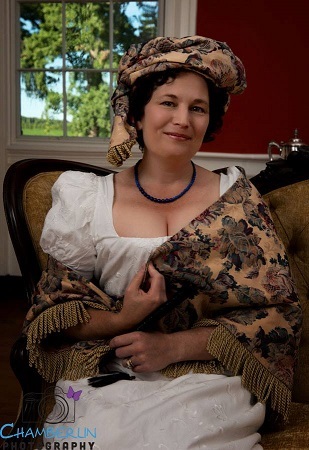 Dolley Madison welcomed the indispensable ladies who are responsible for raising money for much of the furnishing that is carried on at Montpelier today. poses with Jonathan Alger, President of JMU. 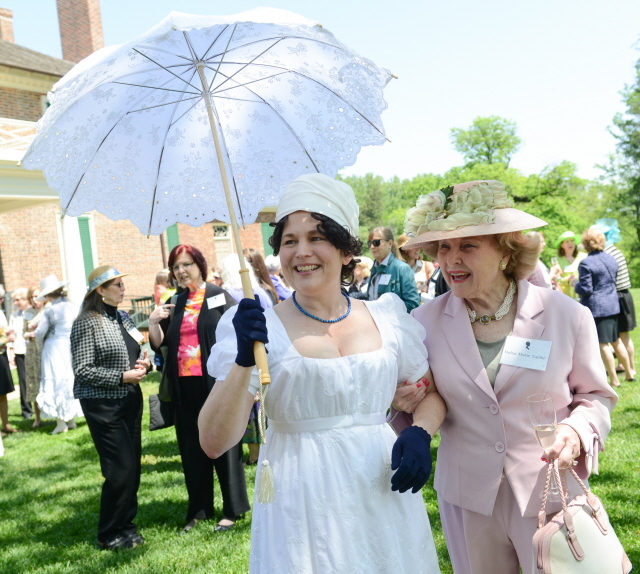 Dolley Madison, America's first First Lady, joined Mrs. Alger, the new First Lady of James Madison University, for an ice cream social on the lawn of the campus. The event featured ice cream through the ages. Mrs. Madison served up cherry pie ice cream (university officials had tasted, and rejected, her favorite ice cream flavor: oyster). There was a 1950s-style stand featuring grape-soda floats in special commemorative glasses. And Mrs. Alger served up the favorite flavors of JMU's new first family (her own favorite is mint). There was even a futuristic ice cream stand, featuring ice cream made with bacon and pop rocks (and they quailed at oyster!). 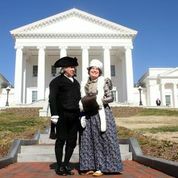 Mr. and Mrs. Madison paid a call on Virginia's General Assembly in Richmond. 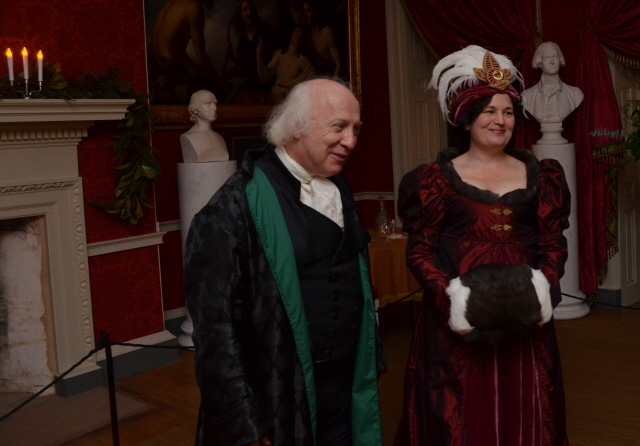 The occasion of the trip was the 200th anniversary of James Madison's second inauguration as President of the United States, and while there we took the opportunity to introduce the new president of Montpelier, Kat Imhoff. In addition, the Virginia legislature presented us with a resolution commending Montpelier for the fine work it does promoting the legacy of the Madisons, and for educating people about America's constitutional government. – For three evenings during the first weekend of December, Montpelier hosted A Candlelight Christmas. 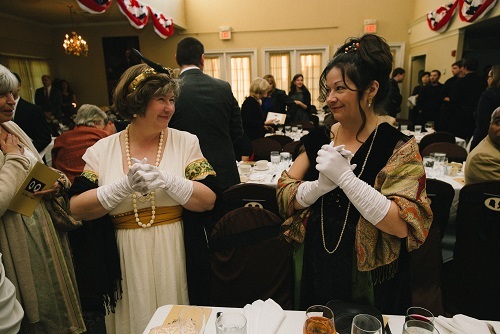 The event was designed to highlight different periods of American Christmas traditions. 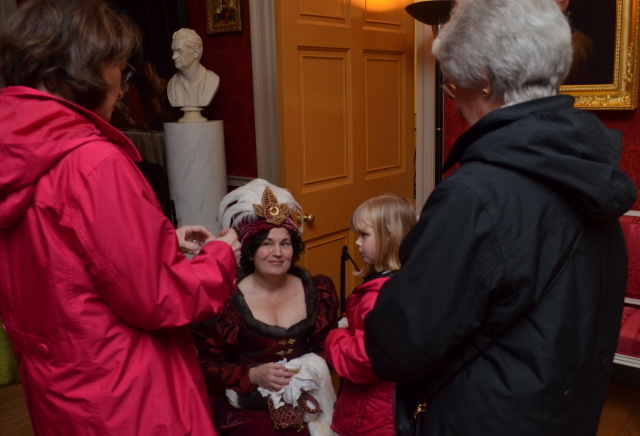 “Dolley Madison”greeted her guests from the perspective of 1835 as they arrived for a candlelight tour of the mansion. 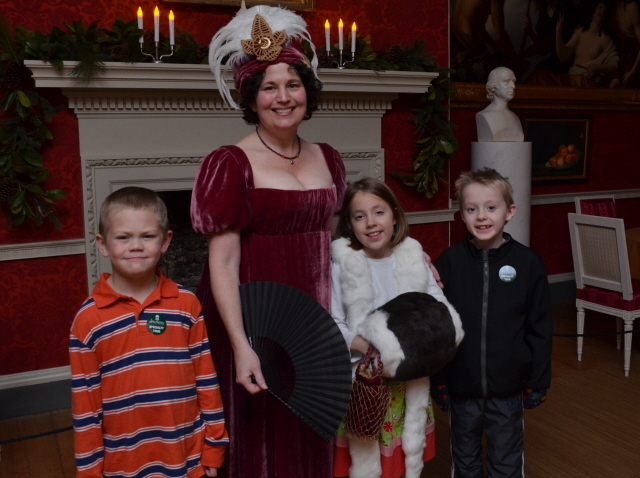 She regaled them with tales of reveling during the winter season in Virginia's countryside. Outside, civil war reenactors huddled around a yule log at their winter encampment. And in the Visitor's Center and DuPont Gallery, visitors sipped wassail, watched the graceful gyrations of the Assembly Dancers, and got a taste of what an early twentieth century American Christmas was like. arrived by horse-drawn sleigh. 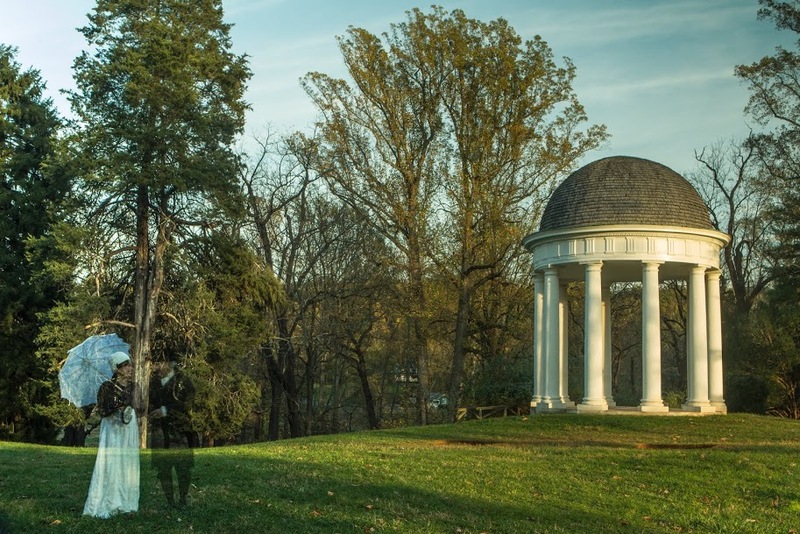 Photos courtesy the Montpelier Foundation. 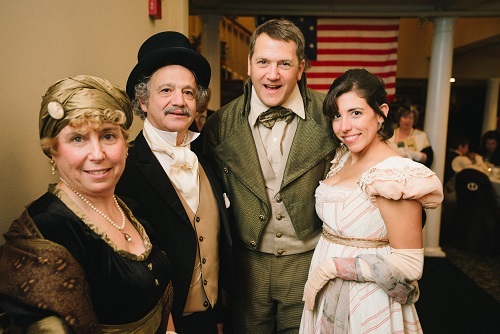 Every year, Montpelier's Constitution Day celebration gets more lavish. 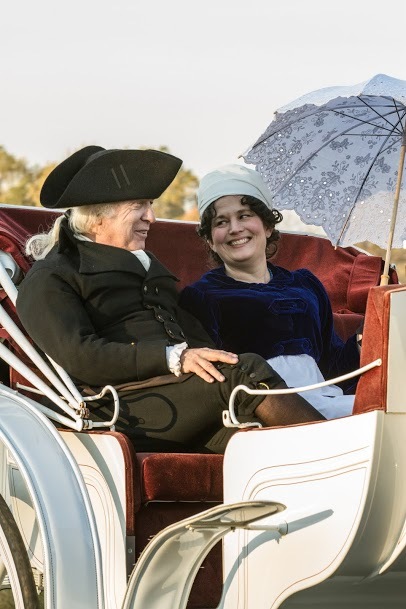 In 2012, James and Dolley Madison arrived at their home in a horse-drawn carriage amid a parade of Liberty Trail riders. 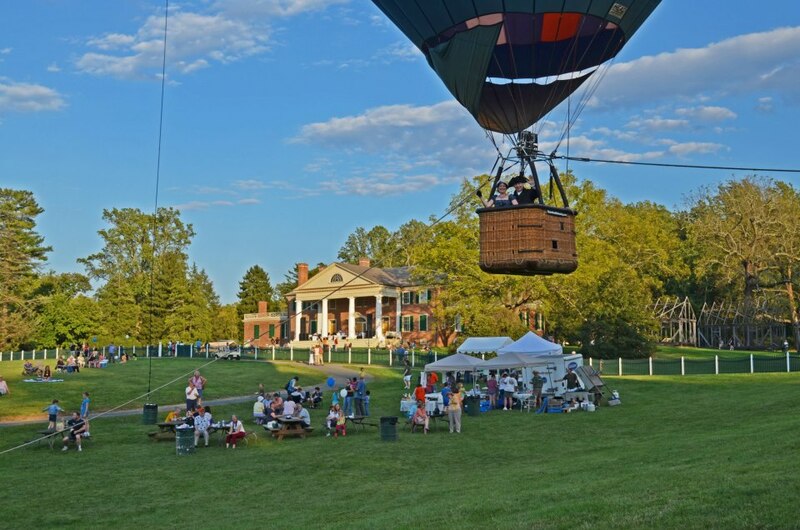 They also took their first balloon ride on the Montpelier grounds. 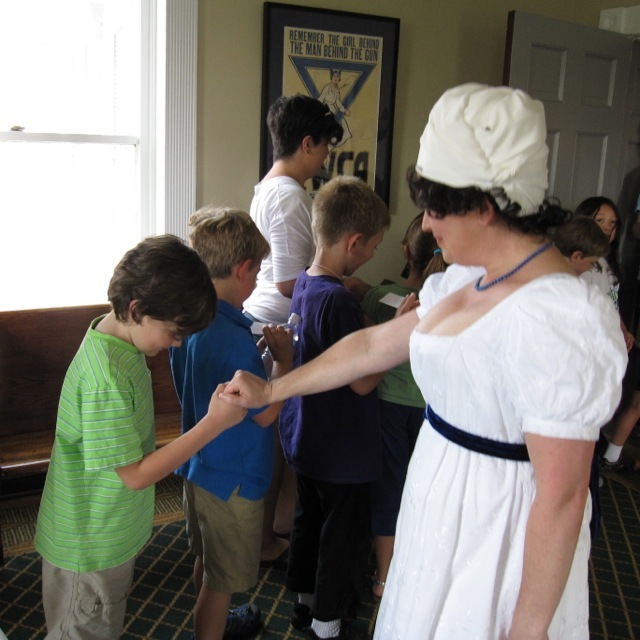 And like previoius years, the enchanting high school group, Project Elightenment, taught the children colonial games while the First Couple hosted a picnic supper with music on the lawn -- and this year their guests numbered over 2,000! The evening was topped off with a spectacular fireworks display. With any luck, September 17 will soon rival the Fourth of July in the heart of every American patriot. 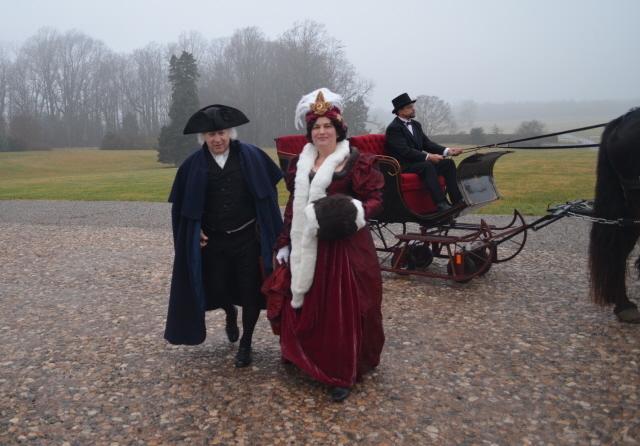 Mr. and Mrs. Madison arrive at Montpelier in style. Photo courtesy the Montpelier Foundation. Mr. and Mrs. Madison get an even better view of the Blue Ridge Mountains than can be seen from the portico. Photo courtesy the Montpelier Foundation. 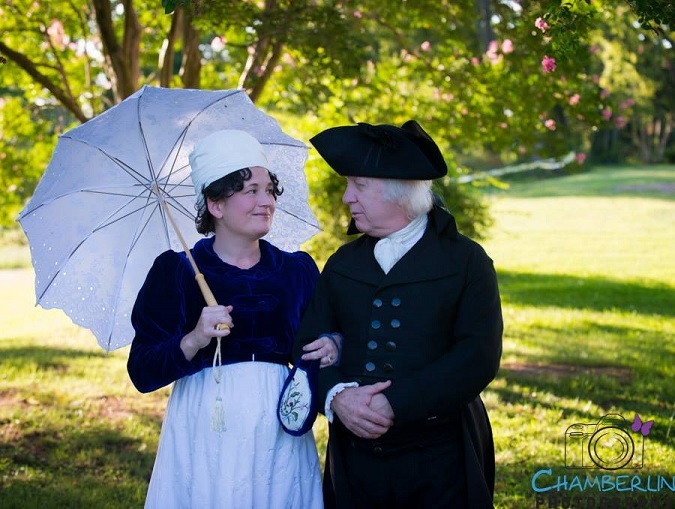 James and Dolley Madison on the spot where they were wed. 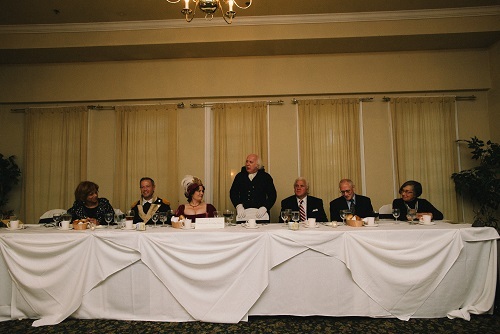 The tall gentleman to their left is Walter Washington, a direct descendent of George Steptoe Washington and Lucy Payne Washington. The black marble mantlepiece is said to have been a gift from General LaFayette to George Washington, and the chair came from Mt. Vernon. 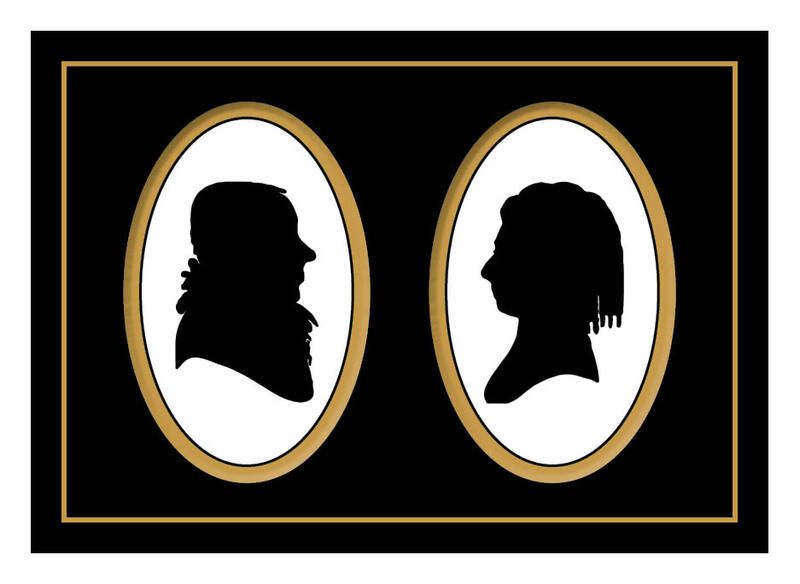 On September 15, 1794, James Madison and Dolley Payne Todd were wed in a small private ceremony at Harewood, in what was then western Virginia. 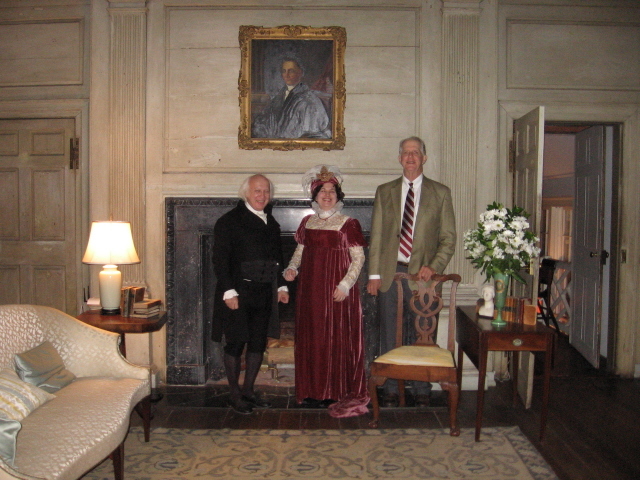 The home belonged to Dolley’s sister (Lucy Payne Washington) and George Washington’s nephew (George Steptoe Washington). 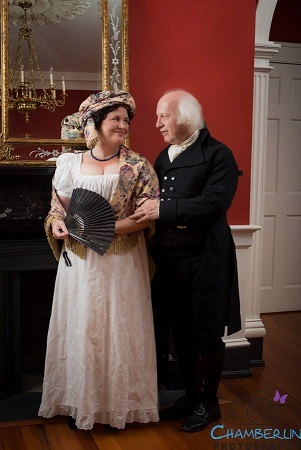 On September 15, 2012, James and Dolley Madison were honored to celebrate their 218th wedding anniversary at a private fundraiser held at Harewood in what is today West Virginia. The room in which they were wed has remained untouched since that day. 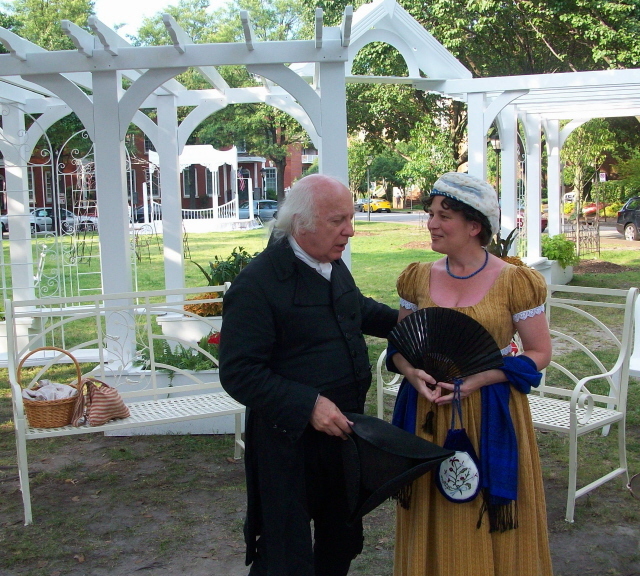 James and Dolley Madison received a warm welcome in Norfolk over the June 8-10 weekend during OpSail 2012. 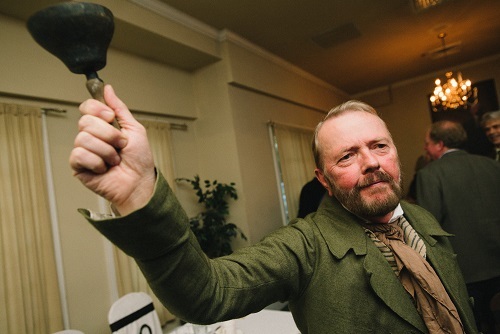 The event featured a fleet of tall ships, a spectacular fireworks display, and an assemblage of notable characters, including “Uncle” Sam Wilson, Francis Scott Key, and former president Thomas Jefferson. President James Madison explained the necessity for the war during informal afternoon conversations. 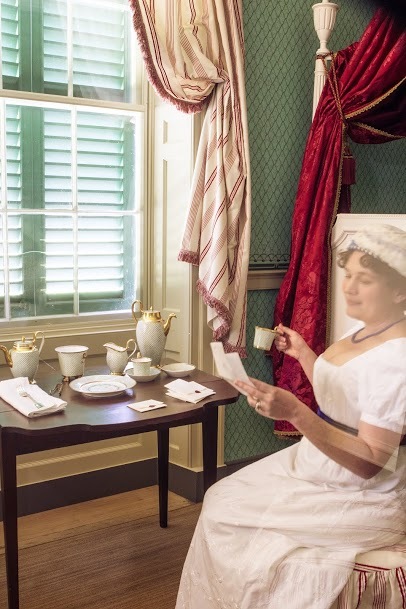 And over afternoon tea, Dolley Madison related to her guests the story of fleeing the White House just ahead of the British invasion. 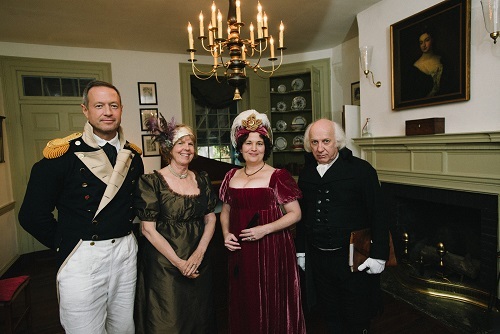 Dolley Madison was delighted to greet so many guests and well-wishers at Montpelier on her birthday, May 20. 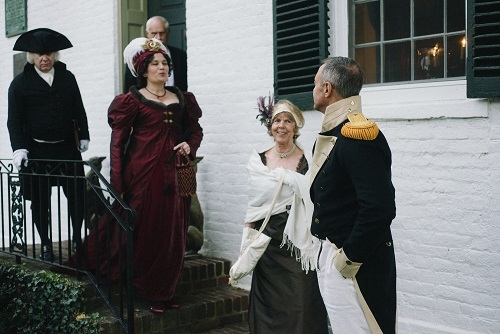 Montpelier forms the backdrop for Season 3 of the PBS series, “A Taste of History.” Chef Walter Staib prepared a glorious feast for "James and Dolley Madison" and their guests. These episodes are now on DVD, which can be ordered from Chef Staib's City Tavern site.